For use in petroleum, chemical tankers, barges and storage tanks. 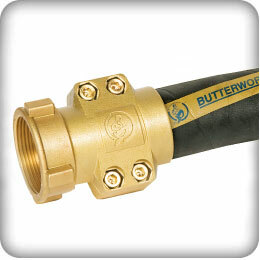 Butterworth Tank Cleaning Hoses are water discharge hoses design and manufactured for the tank cleaning operations. The function of a Tank Cleaning Hose is to transport water or a cleaning solution from a water source such as pump or hydrant to the inlet of a portable tank cleaning machine. Additionally the Tank Cleaning Hose is utilized to suspend the portable tank cleaning machine within the tank to be cleaned. Exceeds industry standards such as the International Safety Guide for Oil Tankers and Terminals (ISGOTT). Four Layers of strong and flexible synthetic braids. ID OD Weight Lengths Coupling Continuity Part No.